Train services on the Dubai Metro Red Line are back to normal, according to the Roads and Transport Authority (RTA). 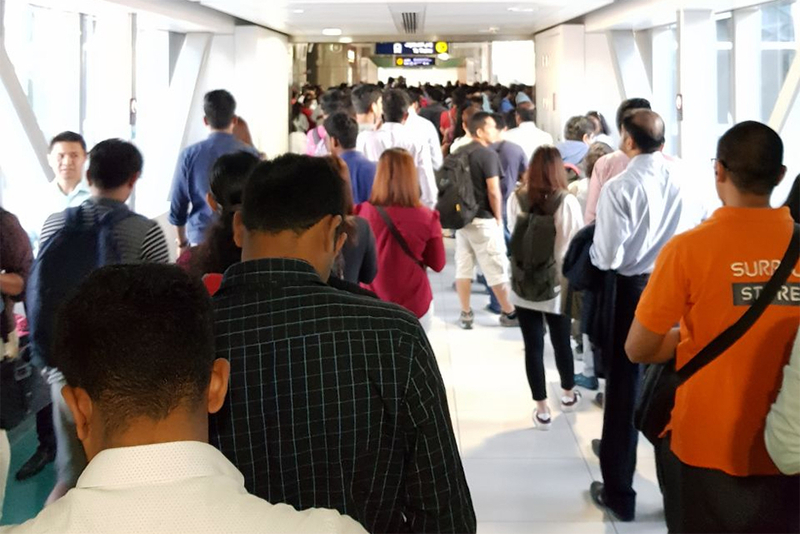 Thousands of passengers were stranded during the Monday morning rush hour after a technical glitch stalled sections of the Red Line, specifically, the JTL and UAE Exchange stations, due to a technical fault. Dubai: A technical glitch on the Dubai Metro Red Line was the cause behind the train's delays, Gulf News has learnt. According to the Roads and Transport Authority (RTA), the network is facing a technical issue in the sector between UAE Exchange and Jumeirah Lakes Towers (JLT). A shuttle train service is being provided for the passengers. Though train services on the rest of the Red Line have been restored, they are running slower than usual, with trains stopping for more than five minutes at some stations on either side. “Trains are taking longer to arrive at the stations and even when they arrive they stop for long for no apparent reason, obviously something is wrong,” said a commuter. Early in the morning many commuters were stuck at different stations for more than two hours, as the train services got interrupted. Thousands could be seen crammed in stations waiting for the trains to arrive.The peak-hour snag meant that the regular commuters reported to work or school late. The #RTA team is working to restore the service as soon as possible. In a series of tweets the RTA apologised to the commuters. “We apologize to #DubaiMetro commuters along the Rashidiya and Jebel Ali direction, specifically between Jumeirah Lakes Towers and UAE Exchange stations, as a result of a technical fault that is currently being resolved," said RTA in a tweet. Another tweet added that a technical team is working to restore the services as soon as possible. Services on the Green Line remained unaffected. Dubai: Thousands of Metro commuters were stranded, with many reporting late for work or school, as train service on parts of the Red Line was stalled during the early morning rush hour on Monday. 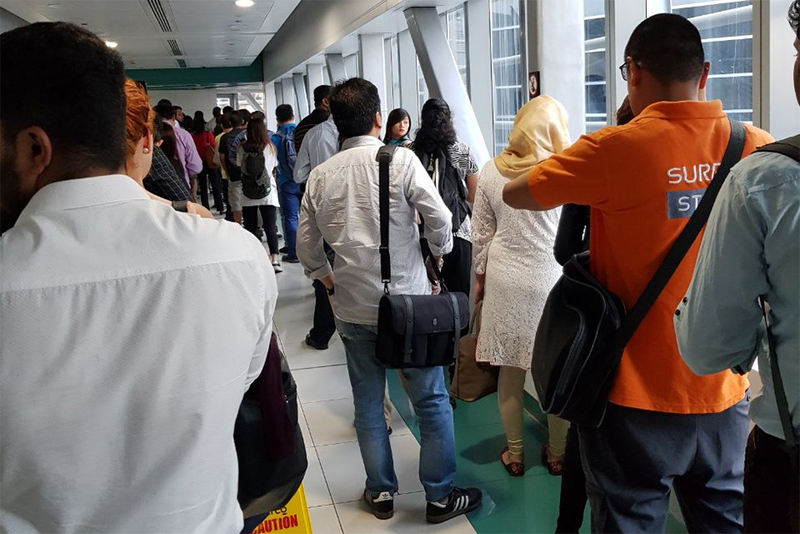 Many commuters were seen queueing up at ADCB (Al Karama), Bur Juman, Damac and JLT metro stations while social media went abuzz with posts stating they are turning up late for work or school exams. It was not immediately clear what caused the glitch, or how many stations were affected — with some passengers reporting seeing for the first time the driverless Dubai Metro being manually driven. In all these years today is the first time I have seen a manually operated #DubaiMetro !!! 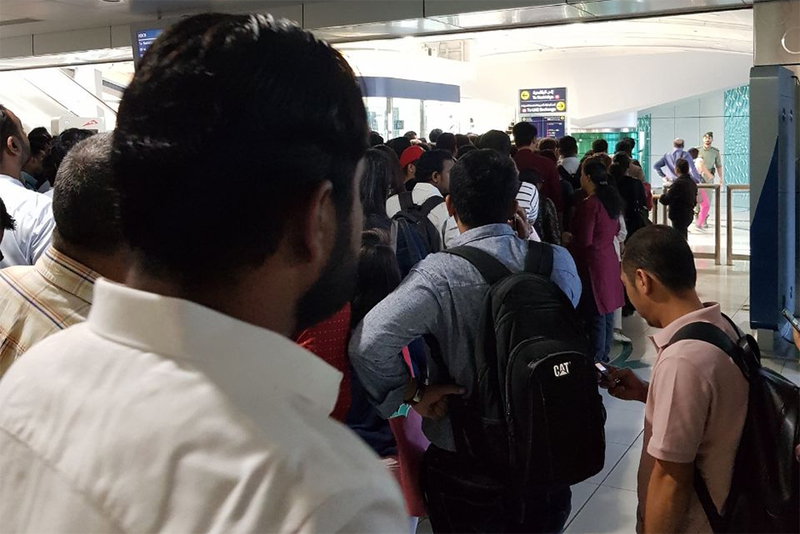 Commuters told Gulf News there was no train service at several stations for more than 30 minutes, while other commuters reported stalled train service for up to an hour. The service was restored later. The stations affected are on the Red Line, which runs from Al Rashidiya to UAE Exchange — spanning 29 stations over 52.1 kilometres. The Metro service was restored after about 40 minutes, according to passengers, but they reported the service stopped again at about 8.25am. 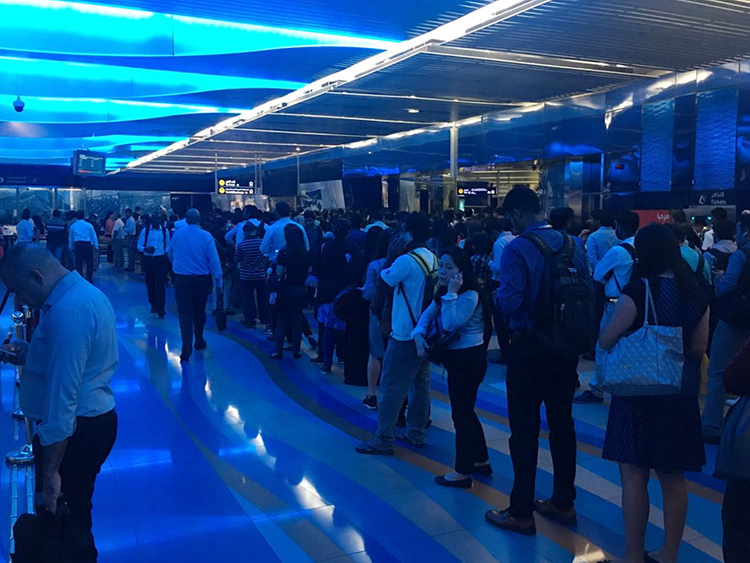 By around 9am, Twitter user @SoniaKhiara posted that no trains were coming from the UAE Exchange to Jumeirah Lakes Towers (JLT) station. A spokesperson of the Roads and Transport Authority (RTA) said they are looking into the issue and will release a statement shortly. Please refresh for latest updates.